So you are going to have a special celebration and would like to serve wine. But what do you do about all those delicate wine glasses. The cost and the care of the crystal glasses could spoil the fun of the celebration. 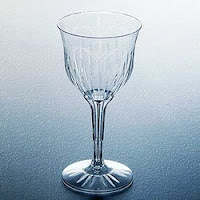 Be smart and use Legacy plastic, disposable wine glasses with the look of cut crystal. They are so finely detailed, it is hard to tell that they are not the real thing. Enjoy your celebration with all the formality of cut crystal, but relax in the knowledge that you don’t have the worry of breakage or clean up. Not only can you be relaxed, but your guests will thank you too. They will not have to be concerned with the possibility of accidentally breaking an expensive glass. The Legacy disposable wine glasses are 6 ounces, just right for your celebration wine. Purchase the Legacy disposable crystal like wine glasses at Reliable Paper. Made by A&E Catering, now known as Covalence Plastics.